Archadeck of Central Connecticut helped this family up their outdoor living game by building them an expansive deck with views for days! 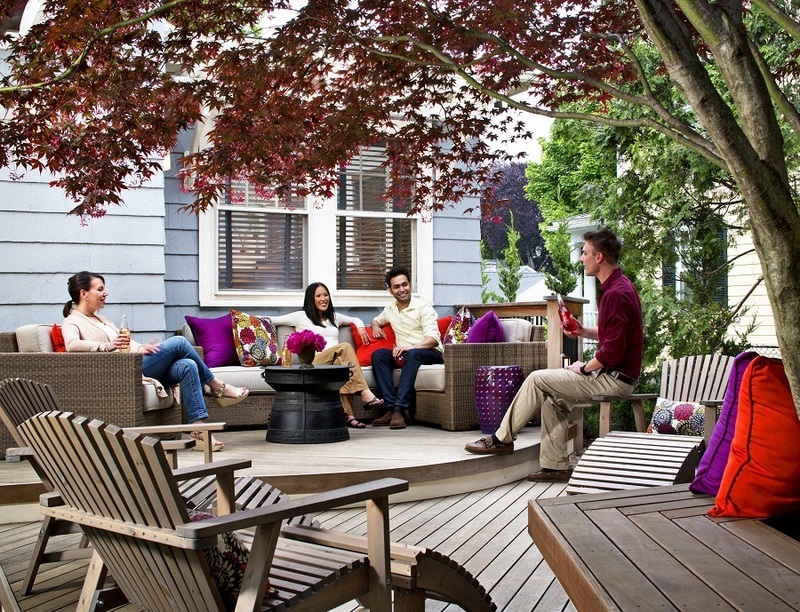 Don’t let your outdoor living aspirations be held captive by an unaccommodating space. 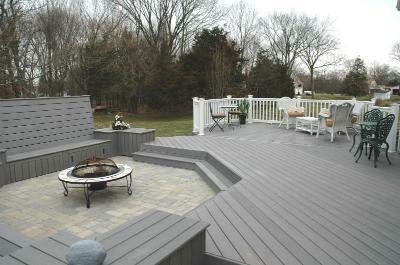 Call on us to enliven your backyard with a custom deck, like these Berlin CT homeowners did. 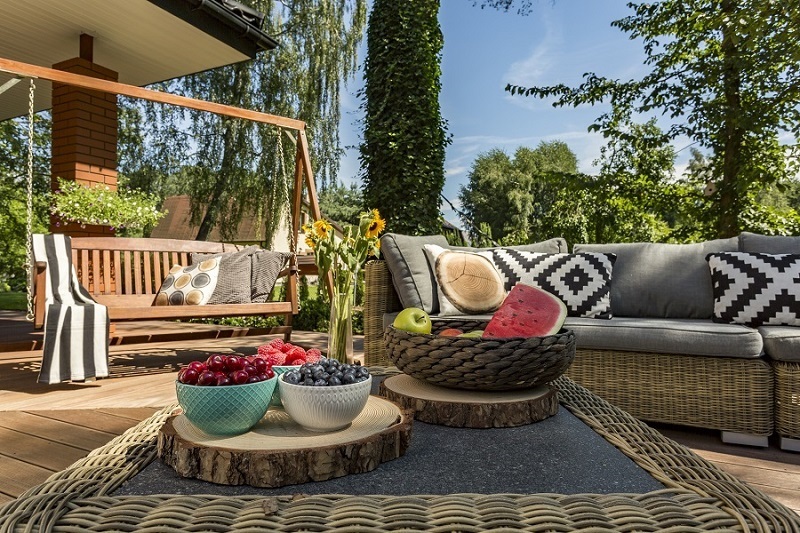 These Berlin homeowners were looking for a reimagined outdoor living space to replace their existing wood deck, which had surpassed its usable lifespan. They needed a new and improved space for entertaining and private relaxation, but went a step further by choosing a sustainable product – bamboo! 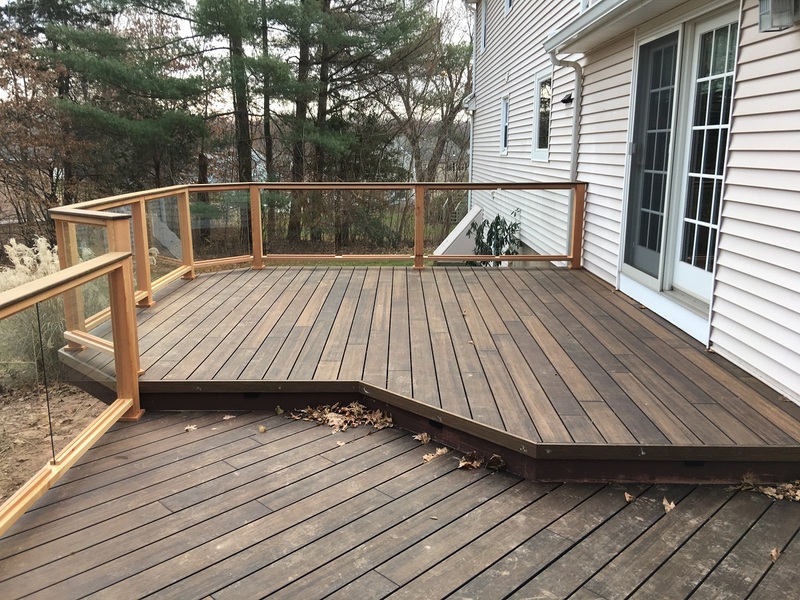 As the area’s only green product outdoor living builder, Archadeck of Central CT was only too happy to provide these clients with a deck that would fulfill all their outdoor living needs, and moreover, one that is truly beautiful! Looking for a central CT green deck builder? Look no further! — Berlin, CT, bamboo deck for strength and sustainability! At Archadeck of Central Connecticut, it’s not just about tearing out the old deck, and building a new one in its place. 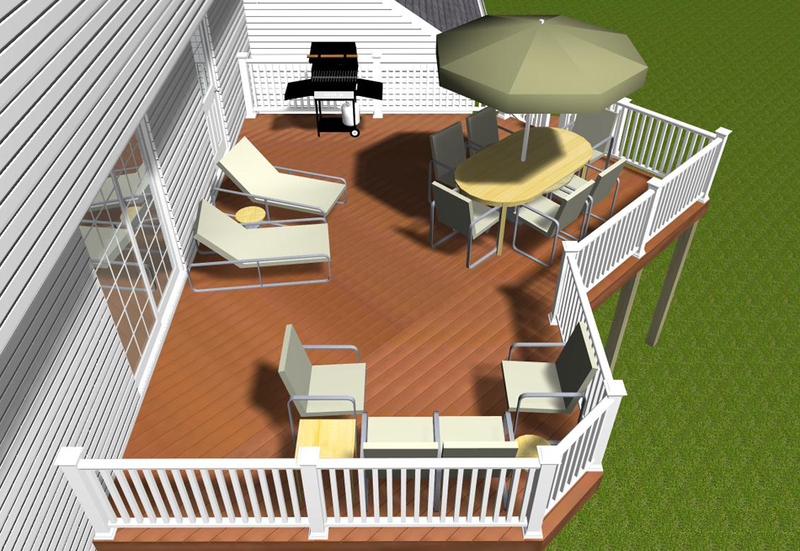 We listen to our clients’ needs for their custom deck design. We want to know what is good or bad about their existing space. We want to know if they require more space, and how they intend to use it. We ask important questions to determine how we can improve upon any elements that are lacking with the existing space. 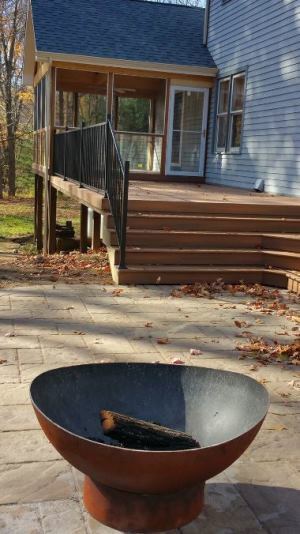 For these Berlin, Connecticut, homeowners, it was important to give them a deck that would breathe new life into the style and intended use of their backyard. Oh, bamboo! Are you too good to be true? — Expansive tiered bamboo deck design in Berlin, CT.
We designed an expansive, multi-level deck to accommodate their desire to entertain. The tiered deck design creates an easy transition and easy entry into the home on both levels, which will accommodate heavy foot traffic for parties and get-togethers. This beautiful deck was constructed with bamboo, which is one of the strongest building materials in existence, actually a grass, not a hardwood! A new bamboo deck by Archadeck of Central CT will stand up to wind, weather, and many years of use, rivaling the hardest of hardwoods. Is bamboo too good to be true? No way! Some of the finer points of custom outdoor living design often aren’t even a consideration for clients. They might believe deck railings are just a standard, necessary element, without realizing that the railings can be an integral part of a beautiful deck design. 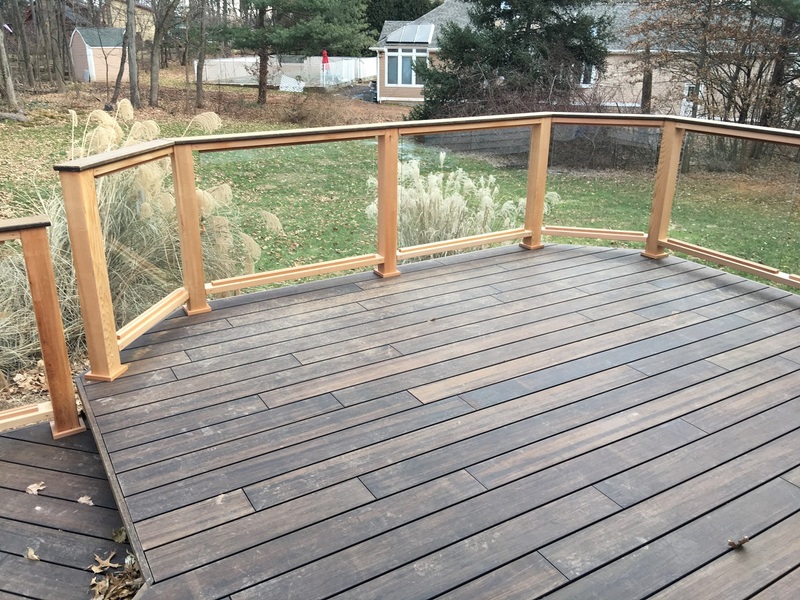 We gave these homeowners a gorgeous cedar balustrade with tempered glass infill and a bamboo top rail. 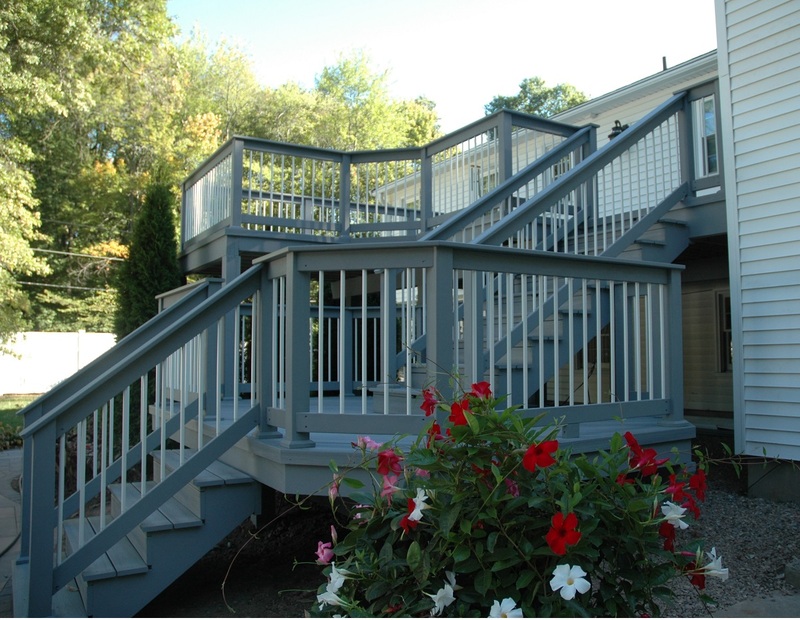 These railings are the perfect complement to the overall look of the space, and will give the homeowners and their guests a completely unimpeded view beyond the deck! 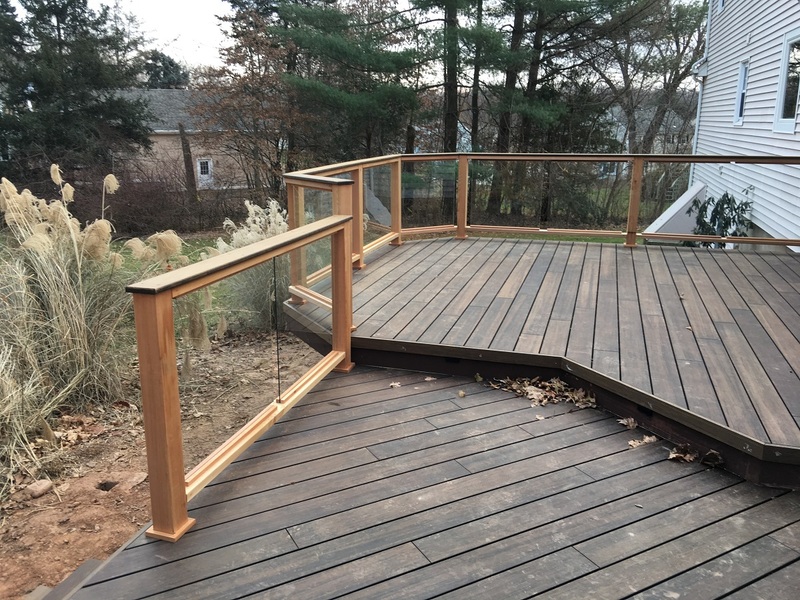 — Cedar deck railing with tempered glass panels and bamboo top rail in Berlin, CT.
Other custom elements of this deck design are in the beveled shape of the transition. Decks do not have to be rectangular! Along the beveled portion of the deck and on the stair risers, we installed deck lighting for use after dark. — Beveled deck transition with deck lighting in Berlin, CT. 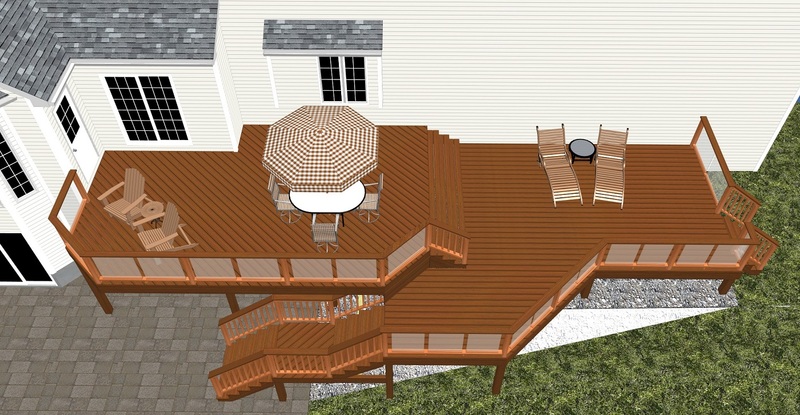 When it comes to sustainable deck design and building, Archadeck of Central CT should be your first choice. Our expertise in green deck building, along with the sustainable products we offer set us apart from all the rest. If you’re looking for a green deck, look no further than Archadeck of Central CT. If you are looking for a green deck builder, contact Archadeck of Central CT today at (203) 793-7142 or email us at a [email protected]. Sometimes the more you know about an outdoor living project, the more beautiful it appears. 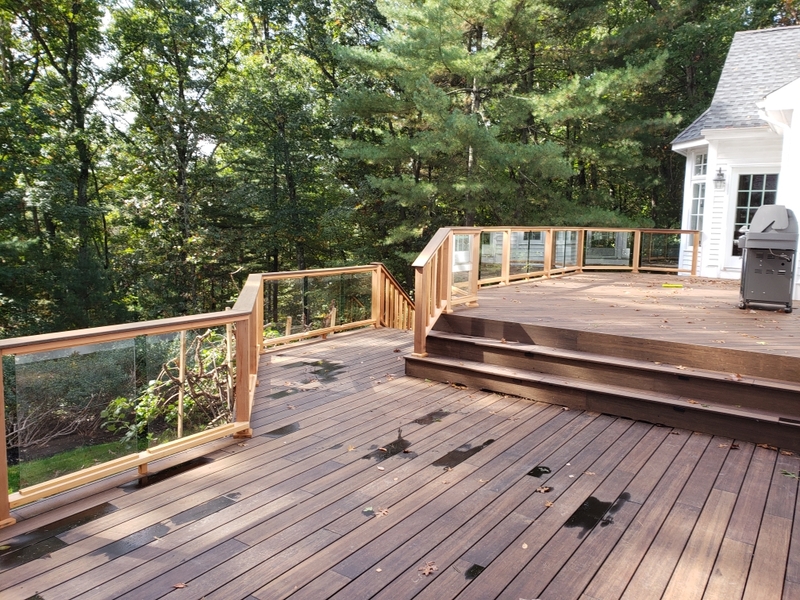 How can we say that about this stunning deck in Farmington, CT? It is already beautiful. Its beauty doesn’t need to be enhanced, or explained. Ah, but just wait until you read the rest of the story. 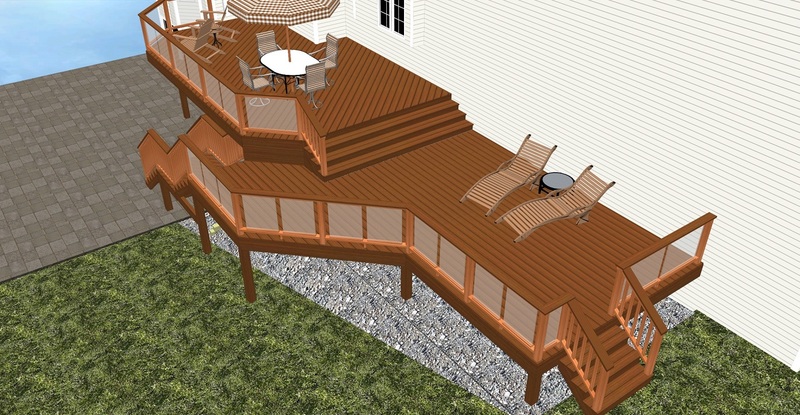 — Design rendering of stunning new Farmington bamboo deck with unique custom glass rail by Archadeck of Central CT. 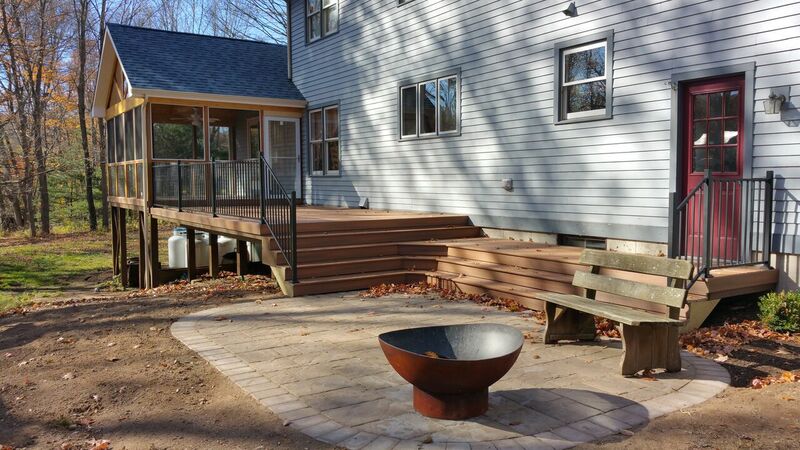 These Farmington CT homeowners knew the time had come to replace their older deck made of pressure-treated wood. It had seen many good years, and its appearance was dated – especially those wood balusters in the railing system. Today’s railing designs include several alternatives to wooden balusters (pickets) that can block so much of the view! Slender metal balusters, horizontal cables and glass panels are a few of the modern alternatives. 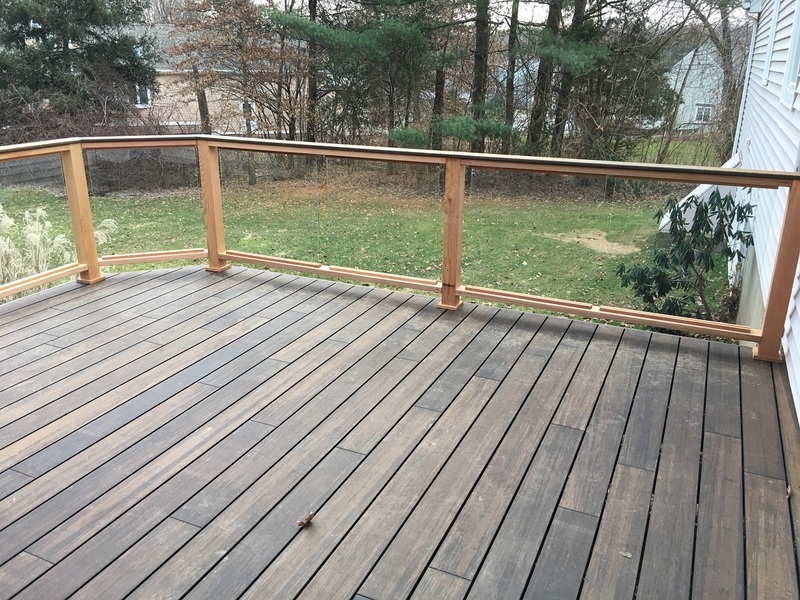 — These Farmington homeowners knew it was time to replace their PT wooden deck, shown above. 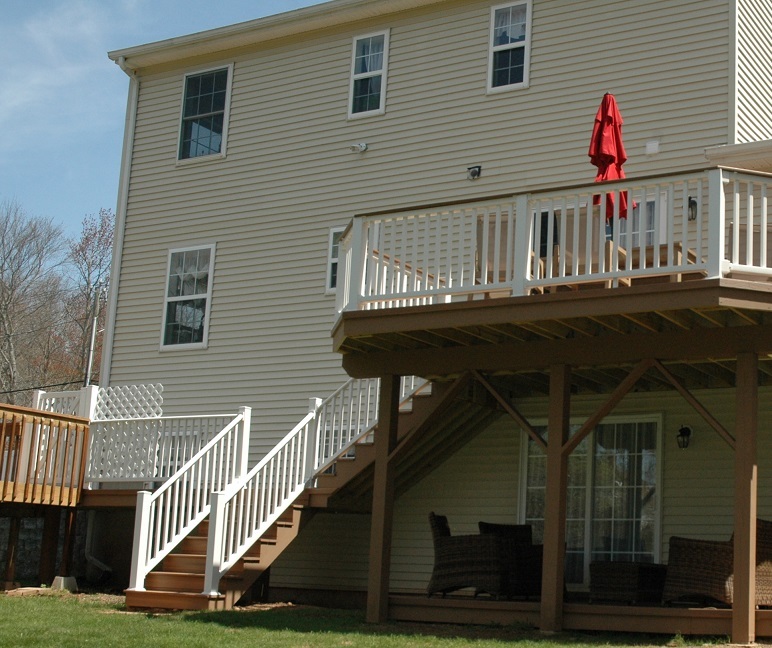 Archadeck of Central Connecticut designed a fabulous deck that retained some of the original features –like the multi-level layout and two sets of stairs to the yard – while changing other features significantly. First, let’s look at the posts supporting the new deck. They look like other posts until you see the base of each post, capped with wood. What’s going on there? These are not just any posts. Traditional support for a deck includes digging a deep hole, pouring a concrete footing and setting the posts into the concrete. No concrete was used here. 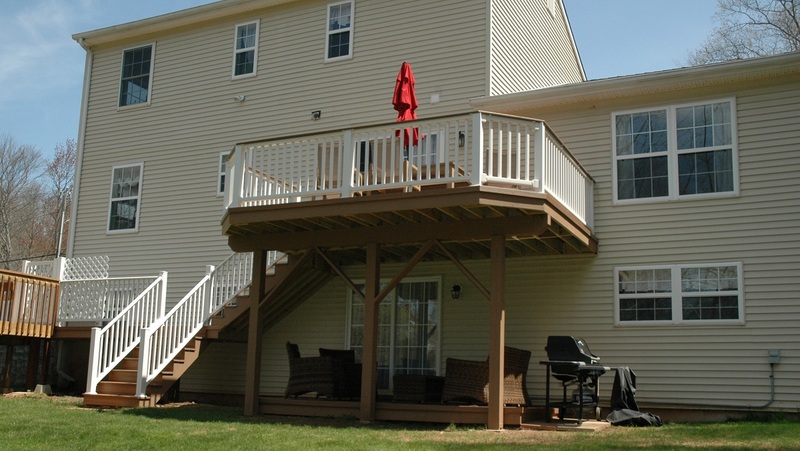 This new deck features wood posts attached to helical piers for additional strength and durability. The helical shape is like that of a screw – a spiral or coil. The steel piers are screwed into the ground deep enough to pass weak and unstable soil until they reach firm soil where the pier is solidly anchored. Then the wood support posts are attached to the helical piers. We added the wood cap around the base of the post to conceal the metal joining. 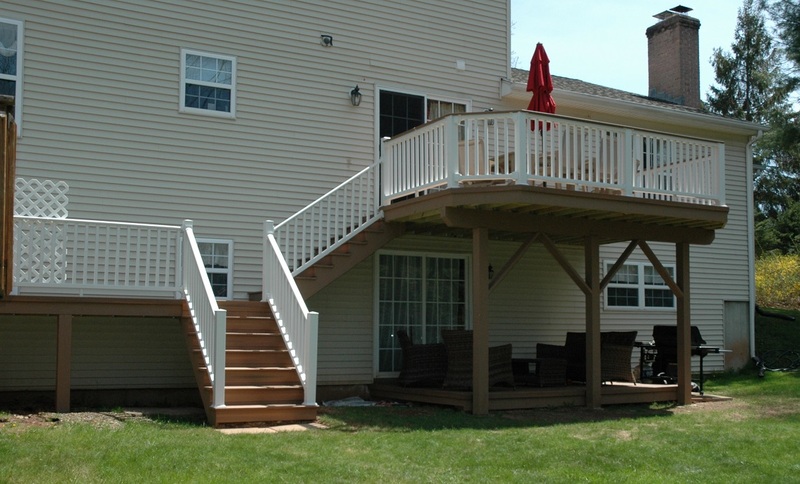 We like to work with helical piers as deck support for two main reasons. First, using this screw-like anchor eliminates the need for pouring concrete footings, which also eliminates construction delays while waiting for the concrete to set. Second, the steel piers are not affected by the frost heave sometimes created by the ground’s freeze/thaw cycle in winter. When is a Wood Deck not a Wood Deck? When it’s Bamboo! 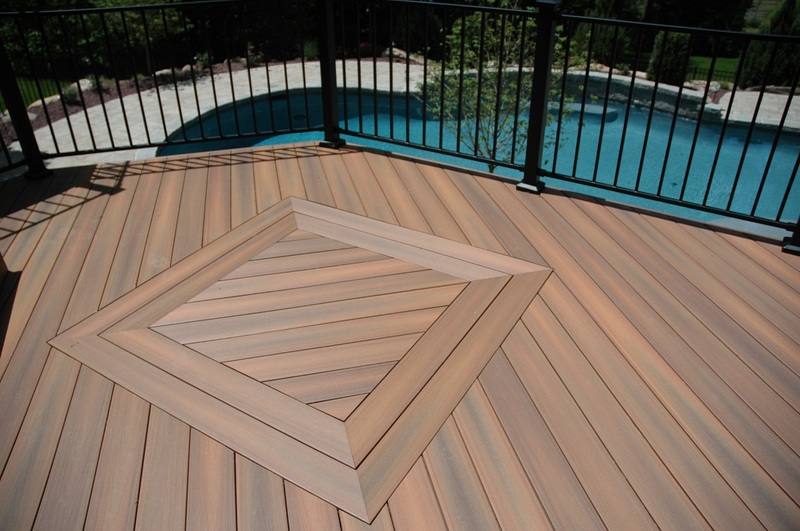 Next, can you tell what material these homeowners chose for their deck surface? It may look like an exotic hardwood, but it’s bamboo, which is actually a grass. The carbonized, fused bamboo boards we use for decking are highly stable, stronger and more durable than most wood, even most hardwoods. Bamboo doesn’t swell or contract in response to moisture; it has a hard exterior, and the cellular interior of bamboo decking is flexible and elastic. 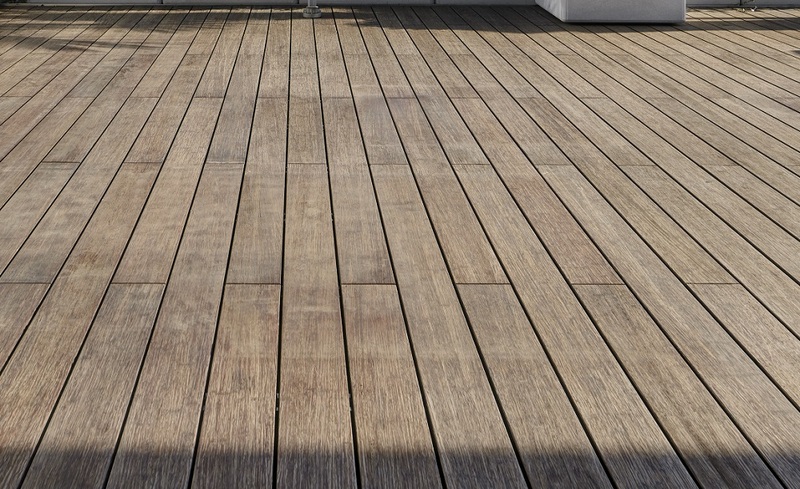 Choosing a green decking option like bamboo for your Connecticut deck offers even more advantages. 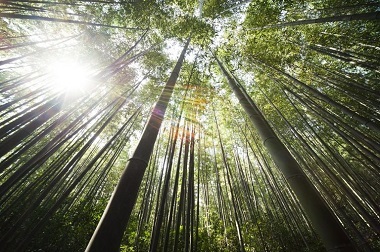 Bamboo is environmentally friendly and sustainable. It matures in 5-7 years and absorbs 35% more carbon dioxide per acre than trees do. 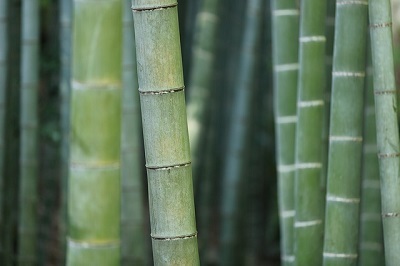 Bamboo is resistant to insects so it doesn’t require pesticides or other harmful chemicals for protection as it grows. And bamboo does not contain rays or knots commonly found in wood. The bamboo decking boards come with a factory-applied coating that, over a few months, lightens up a little, creating natural-looking variations. It can then be re-coated, but most folks don’t do that because it looks really nice as is. You can re-coat bamboo at any time in the future and it will come back to the original deep brown color. 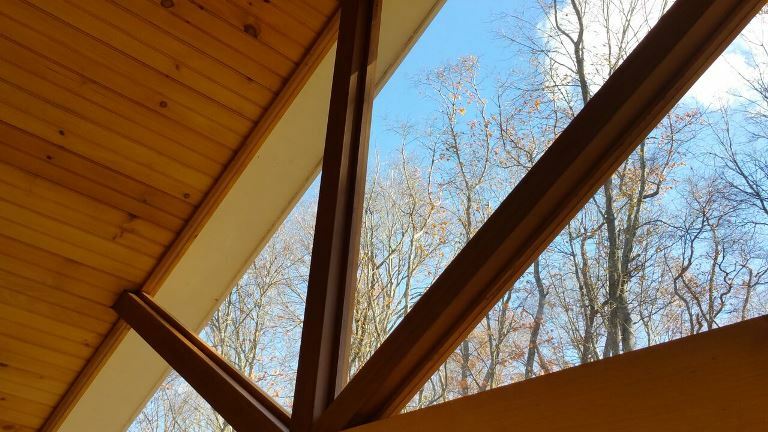 In this project we clear-coated the cedar rail components and used dark stain on all of the support columns and beams made of traditional wood. We stained any wooden framing materials that were visable. The only wooden element of the project that was not stained or coated were the joists, which are hidden from view under the deck. There’s something else you should know about this bamboo deck: there are no visible screws anywhere on this project. We used hidden fasteners to connect the decking to the wooden support structure. We counterbored and countersunk every screw used to fasten the stair treads and all the screws used to fasten the bamboo rail cap to the cedar rail components. For the ultimate smooth and polished look we then used bamboo plugs to fill the holes over the screws and sanded them so they are virtually invisible. We are proud of our workmanship, and we know work like this is the exception rather than the norm. Finally, we get to the glass-paneled railing system. Beautiful, right?! Deck builder Archadeck of Central CT custom engineered the glass panels to set off the posts for added flair instead of having the glass completely fill the space from post to post. We also used 1/4" glass instead of the typical 3/16" thickness. Glass provides maximum visibility as you look out over the yard, much more so than those old wooden pickets. 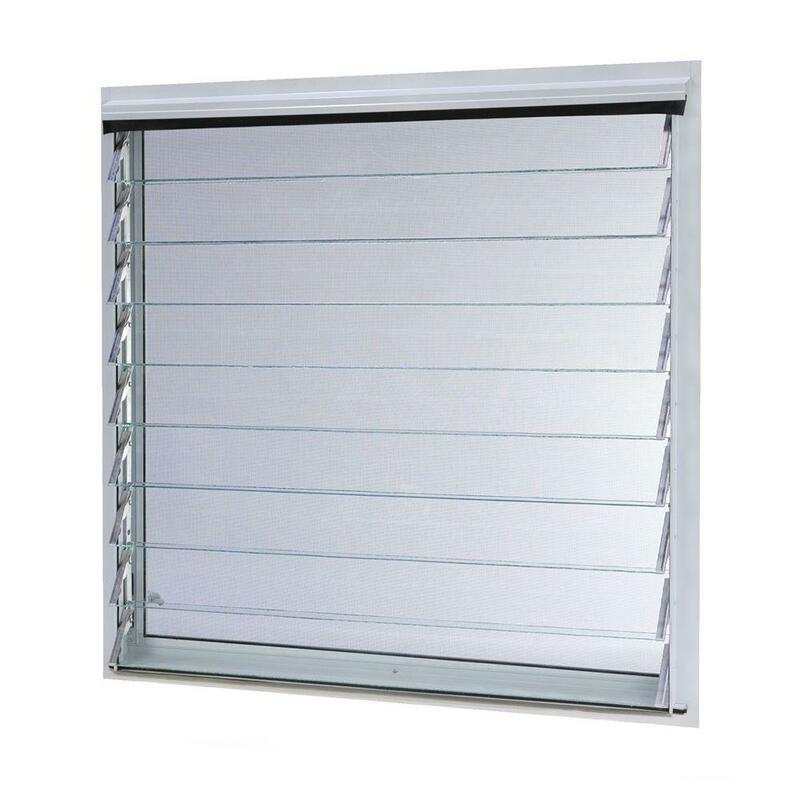 This is tempered glass, which is required by code any time glass is used within 18" of any walking surface, whether it is a room or deck. Tempered glass is four to five times stronger than regular glass. 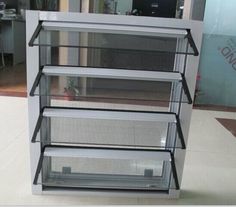 It is more resistant to breaking and shattering, and, if it does break, tempered glass will shatter into small pieces. The chance of injury from broken tempered glass is lower. Also, the edges of the tempered glass are polished to protect anyone from being cut. Finally, we included LED integrated stair lighting for safety on the deck stairs. The homeowners are thrilled with the updated look of their new deck, especially the bamboo and glass. If you are ready to replace your aging deck with one featuring a fresh design and 21st-century technology, Archadeck of Central Connecticut is the deck builder you have been searching for. We will design and build the perfect outdoor space for your home. Call us today at (203) 793-7142 or email us at a [email protected]. If your family is going through changes, take Archadeck of Central Connecticut with you! 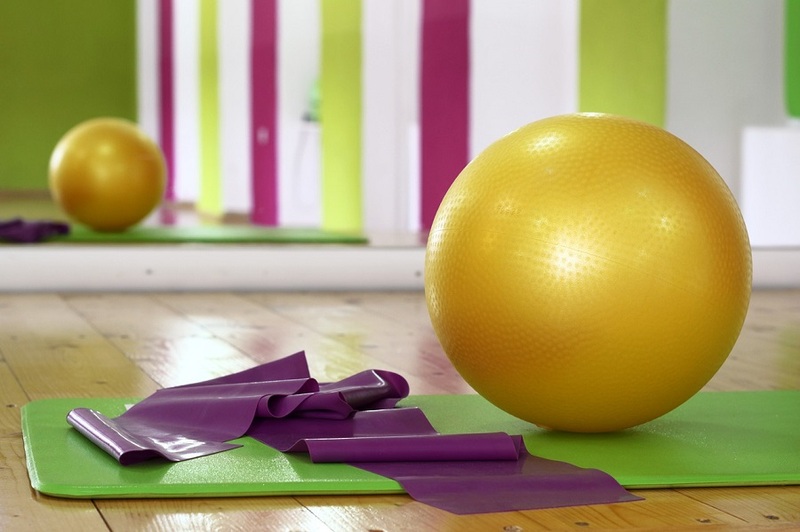 Whether it’s a physical address change or a lifestyle change, we want to be right there. An excellent example of how this works is the story of a family for whom we built a Fiberon low-maintenance deck in Middletown, CT, several years ago. They loved the work we did there. They felt strongly about the level of service we provided and the high quality of the outdoor living space we designed and built. Because they were so pleased with the job, when they moved they called us again. Not only did they want us to return to design and build their new outdoor living space, they wanted to use Fiberon as their decking material again. Repeat performances all around! When the clients moved from Middletown to Cromwell, they decided to refresh the existing deck at their new home, and they wanted to link the house deck with the pool deck. This home had decks attached to the house at two levels—a second-story deck and a ground-level deck below it—and a pool deck that was completely separate. The lower deck didn’t need to be completely replaced, so we kept its existing substructure and only redecked the surface with new decking boards. Our redesign of the upper deck includes a landing partway down the new stairs that connects to the pool deck. This design is a huge improvement for the homeowners. The previous configuration had them walking down the deck stairs, through the yard, and up another set of stairs to the pool deck. Now they have a choice when they start down the stairs and reach the landing from the upper deck. They can either continue down the stairs to the yard, or they can follow the landing across to the new gate for the pool deck. The Fiberon color our clients selected for their upper deck replacement Ipe (pronounced ee-pay, the color of an exotic hardwood), and they selected vinyl railings. They are fully invested in the low-maintenance outdoor living lifestyle. 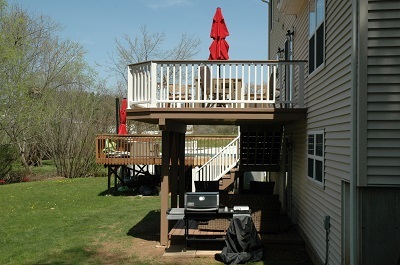 Beneath the upper deck, the homeowners have a shaded area with comfortable seating on the lower deck. 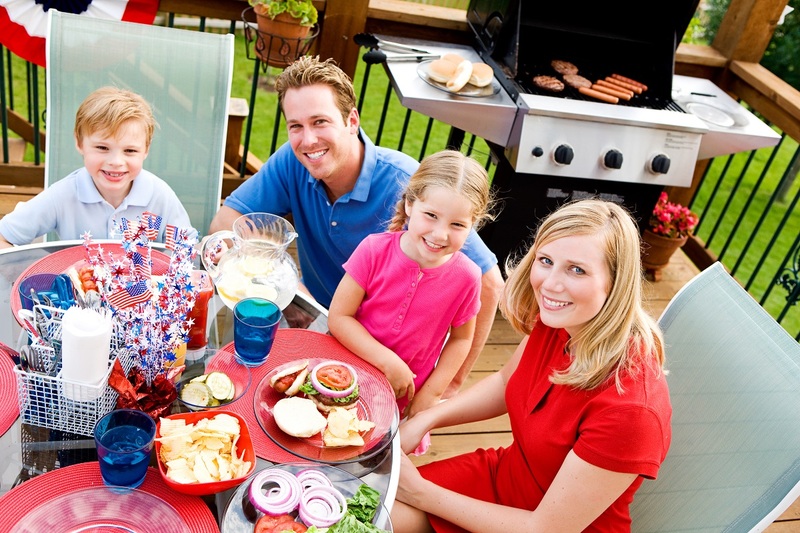 The grill can be positioned right at the edge of the lower deck so the grill isn’t under the covered area, yet the grill master can remain in the shade while grilling. 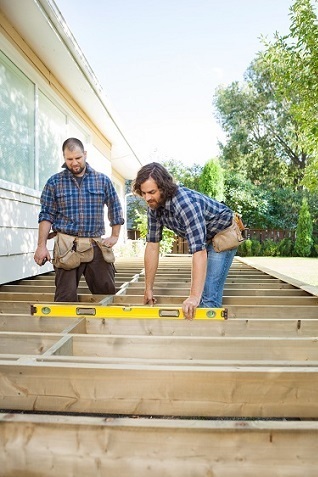 If you are considering a new deck, replacement deck or redecking at your Middletown, Cromwell or Central CT home, call us to talk about your ideas and see how we can serve you. Call Archadeck of Central Connecticut at (203) 793-7142 or email us at [email protected]. 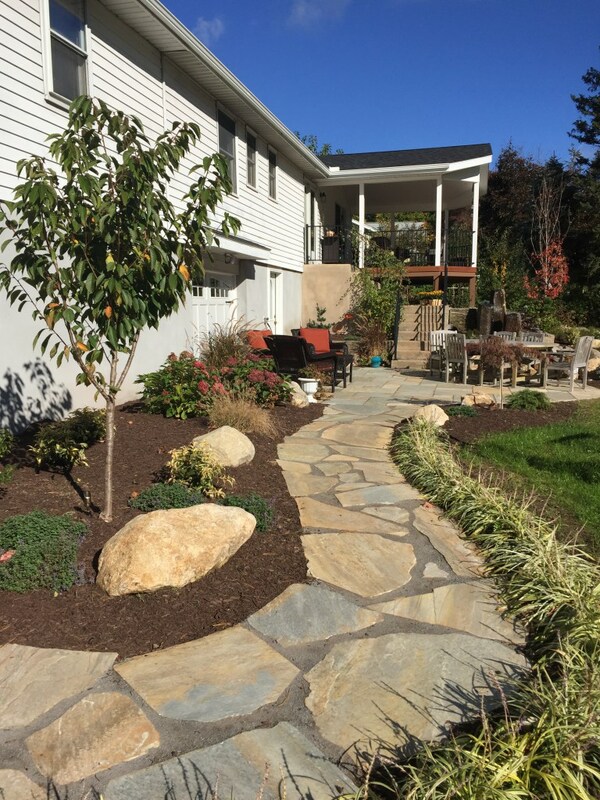 Across central Connecticut, we have left a trail of happy clients who love the outdoor spaces we’ve created for them including decks, screened porches and patios. In each of these cases, the new structure we designed and built was attached to their home with a door leading from the main house to the new addition. The exceptions are gazebos, pavillions and in some cases patios, which you could argue are not attached in that way. 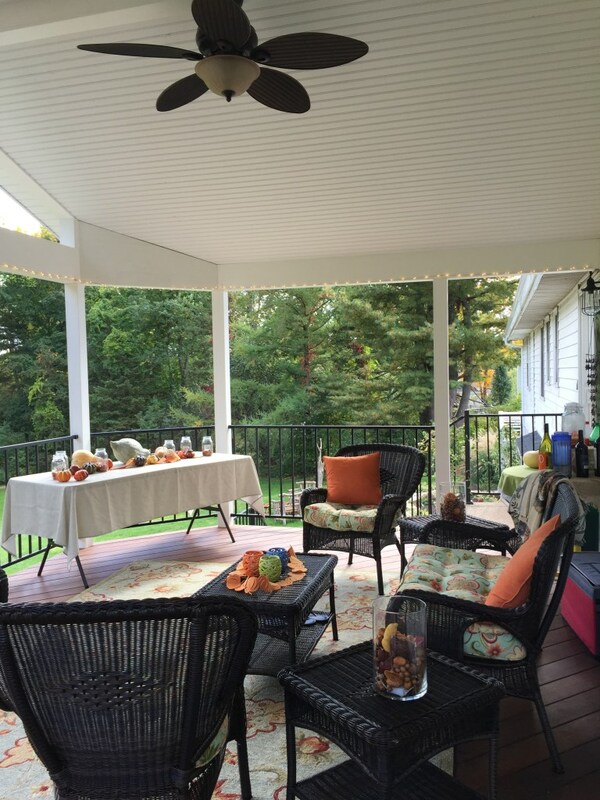 — One of our recent open porch additions serves this family well for outdoor entertaining. Currently, we are exploring the concept of building an outdoor structure on the client’s property but not directly attached to the client’s house. We’ve all seen this in the form of a detached garage. Some detached garages are built with an apartment or some type of living quarters above the garage itself. We want to take that idea to another level, whether it is for recreational purposes or for workspaces. The purpose of a detached structure on one’s property has never been limited to living quarters. Several examples come to mind. Besides the garage, the earliest use might have been the woodworker’s workshop and the garden shed. In both of these examples, the intent would have been to build a structure in which the woodworker or gardener could store tools and supplies. They also needed a workbench or table, basically, a place to work. Next comes the “she shed.” In contrast, we typically think of a man cave as being inside the house, usually in the basement or a spare den or bedroom. Women must have an inherently greater need to get out of the house because we’ve come to think of their escape structure as being detached from the home: the she shed. Maybe it was the garden shed that first morphed into a she shed. Somewhere a woman decided she could use that shed however she chose, and that usage did not have to include gardening — or any work, for that matter. Ideas like this spread like wildfire now in the electronic age where we share so much through social media. Just search Pinterest for “she shed” and you’ll see what we mean. And, of course, we would include she shed, man cave, workshop and garden shed on a list of potential uses for a detached building at your home. Some of these uses seem purely recreational and some seem work-related. Who’s to say which is which (besides your tax accountant when you’re looking for deductions)? Is the art studio of a full-time attorney who dabbles in painting landscapes any different from that of a working artist totally self-supported by her artwork? Her sewing? Her writing? At what point do crafts stop being recreational and start paying the bills? If you call it an outdoor living space, must you only dabble in hobbies there, or can you perform “real work” there, too? As designers and builders, it’s not for us to say that any one use for a detached outdoor living structure is more legitimate than another. 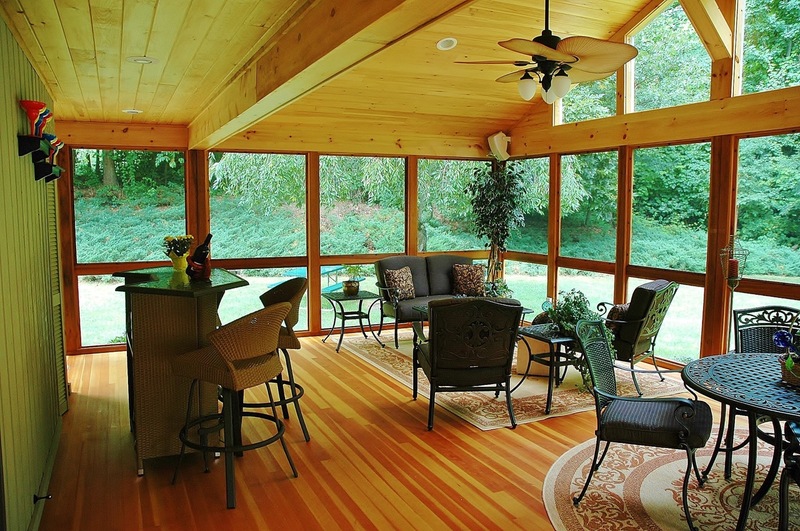 At Archadeck of Central Connecticut, we design and build outdoor living structures. We don’t tell you what you can or can’t do with them. It’s our job to ask you how you want to use your outdoor space — and then to collaborate with you in designing it to meet your needs. We’re simply suggesting that you might want to consider adding a detached outdoor living structure at your home for any number of leisure or professional purposes. If you’re interested in talking with us about your ideas for a new detached outdoor living structure at your home, contact us to learn more about how we can exceed your expectations. Call (203) 793-7142 or email us at [email protected]. 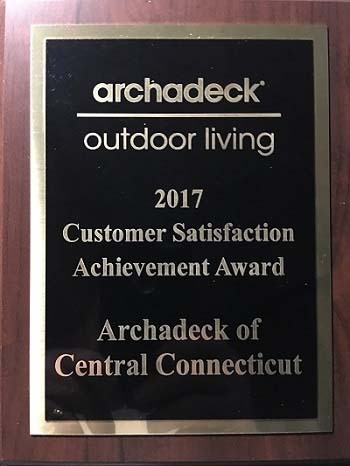 Archadeck of Central Connecticut is thrilled to have been awarded an Archadeck Customer Satisfaction Achievement Award at the Outdoor Living Brands Annual Meeting recently held in Scottsdale, AZ. Recipients of this award are chosen based on their Net Promoter Scores (NPS). The Net Promoter Score is a customer satisfaction, customer experience and loyalty indicator measuring how likely customers would be to recommend a company, product or service to a friend or colleague. The Net Promoter Score is derived from asking customers one question and rating responses based on a 0-to-10 scale. Archadeck customers see this question after their outdoor living project has been completed. The question asked of these customers is this: “How likely are you to recommend [this company, this product, this experience, this representative] to your friends, family or business associates?” The Net Promoter Score is used across industries as a way to quantify customer satisfaction. We’re proud to announce that we finished the 2017 calendar year with a perfect Net Promoter Score of 100, the highest possible score! We want to thank all of our 2017 clients for entrusting Archadeck of Central Connecticut to design and build your outdoor living projects. Knowing you will recommend us to your friends, family and colleagues means the world to us. By definition, a Net Promoter Score of 100 also means we achieved the Best-in-Class customer satisfaction rating based on the NPS system. 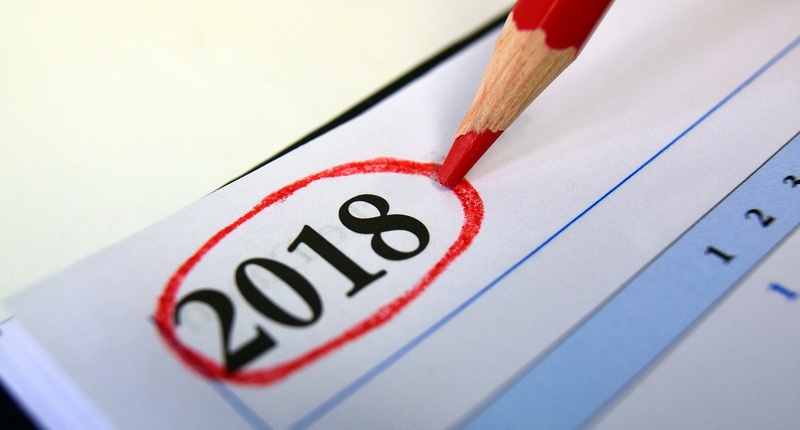 All scores over 50 are considered “Best-in-Class.” Many of the top Fortune 500 companies use this metric to keep track of their customer loyalty and retention. Examples include Apple with an NPS of 72, Southwest Airlines with an NPS score of 62 and Amazon, which also has an NPS of 62. 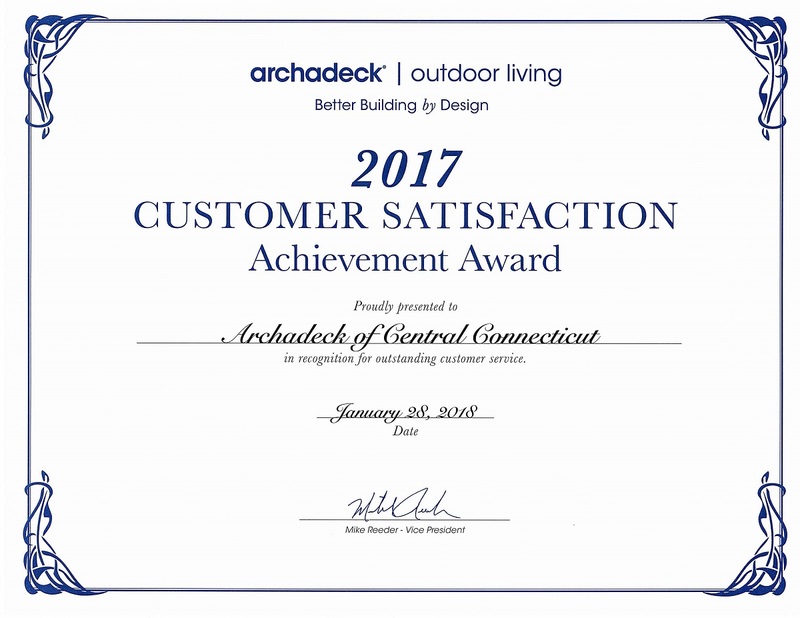 We are proud of the hard work our entire team puts in every day, because that certainly contributed to Archadeck of Central CT winning this customer satisfaction award. You can rest assured we are the company you keep and we’ll still be around years down the road. This is because we offer quality products and strong warranties, use highly-skilled carpenters and craftsmen and know what it means to keep our customers happy. — Our goal is to make all our customers happy, even the 4-legged kind! Contact us today to learn more about working with a Best-in-Class outdoor living company! You can reach us at (203) 793-7142 or send us an email at [email protected]. Sometimes you just need to see your surroundings with fresh eyes. 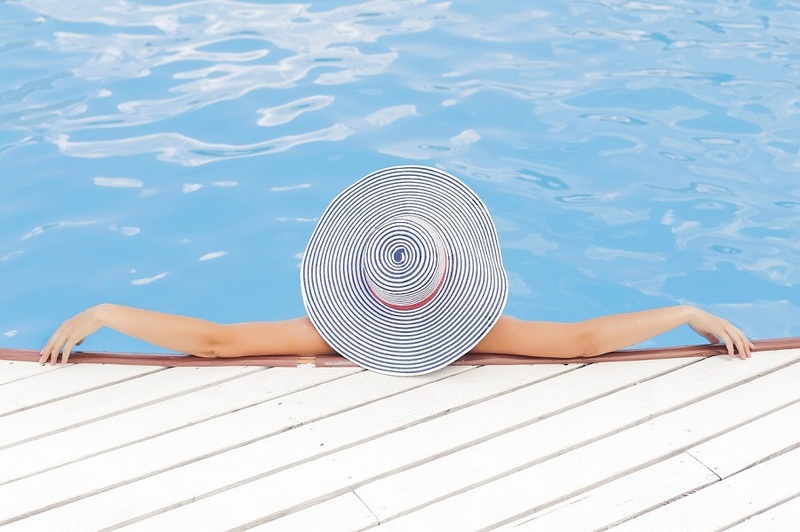 Picture this: you’re on vacation or a business trip and you’re enjoying top-of-the-line accommodations. You admire the resort’s elegant cabana overlooking the indoor-outdoor pool and its terraced surroundings. You especially admire the multi-level deck that starts near the pool and goes off in several directions. With short stairways leading from one level to another, each landing on the deck is comfortably furnished as an alcove for conversation, private dining and relaxation under the stars. Subtle lighting nestled among the deck’s many planter boxes offers an ambiance of casual luxury. It feels good to get away, but it always feels great to get back home again. And yet, the feeling you had at the resort lingers. Can you recreate this at your home? Oh, yes you can, if you know the right people … someone to listen carefully as you describe not just the physical characteristics of the place, but the way it made you feel. Someone who can take what you describe and come back with three-dimensional renderings that bring your vision to life on the page or screen. An experienced designer of outdoor living spaces who can create designs, indoors and out, that will allow you to experience nature’s beauty at home while keeping you snug in the winter, cool in the summer. You’ll want a designer who can recommend the best materials and explain the differences when it’s time to make your selections. Would you prefer top-quality, exotic hardwood decking or the newer low-maintenance decking products that offer incredible endurance and always look new? Would you prefer a screened porch with open rafters or beadboard ceiling — or one that lets in the sun’s sensuous rays through carefully-placed skylights? Will your new sunroom dazzle you with craftman-inspired tile or the warm glow of polished wood? You’ll want someone who can custom design an outdoor living space that’s just right for your family no matter how many contradictions that embraces. Someone who has enough experience with innovative design features that they can design what you ask for … and take it a step or two further in ways you may not have imagined. That designer of the perfect upscale outdoor living spaces is Archadeck of Central Connecticut. We know how to listen, so you’ll get the unique deck, porch, sunroom, 3-season or 4-season room that fits your family’s lifestyle, not a tired design out of a book. We have mastered the art of deluxe outdoor living spaces, too, so as to combine structures that complement each other while making your home a welcome retreat or a vibrant showplace. Maybe it’s a new, bigger sunroom with French doors that open onto a screened porch with a massive stone fireplace. Or a great wrap-around deck opening off of a 4-season room that becomes a sports oasis where friends and family always gather to watch the big games. 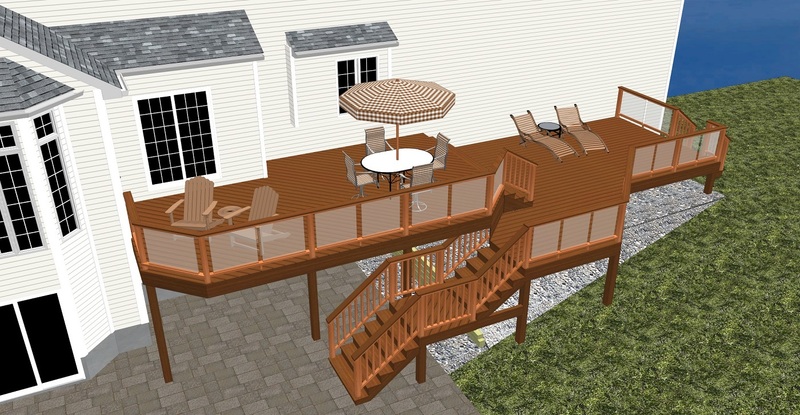 Archadeck of Central Connecticut listens to you and what you want in an outdoor living design. We communicate with you at every step of the design and building processes to eliminate surprises. We hire skilled craftsmen who always exceed expectations. We help you select the quality of materials that you want in your home. The outdoor living spaces we build appear original to the home, not something “added on” as an after-thought. We know you are an exacting client, and we will not disappoint. — Luxurious outdoor kitchen and custom pergola in Cheshire, CT.
What’s more, we know you can hire anyone you want to design and build your central Connecticut outdoor living space. When you choose us to bring your outdoor living ideas to life, we want you to be so pleased — yes, thrilled — that you recommend us to your friends and colleagues at every opportunity. Quality is important to you, the homeowner, and it is equally important to us. If you want to recreate a luxurious experience you had while traveling, or you’re ready to re-imagine your home’s outdoor living space with fresh eyes, contact us to learn more about how we can exceed your expectations. Call (203) 793-7142 or email us today! This Durham, CT, Deck Outdoor Living Trio Creates the Perfect Harmony for Outdoor Living Enjoyment! 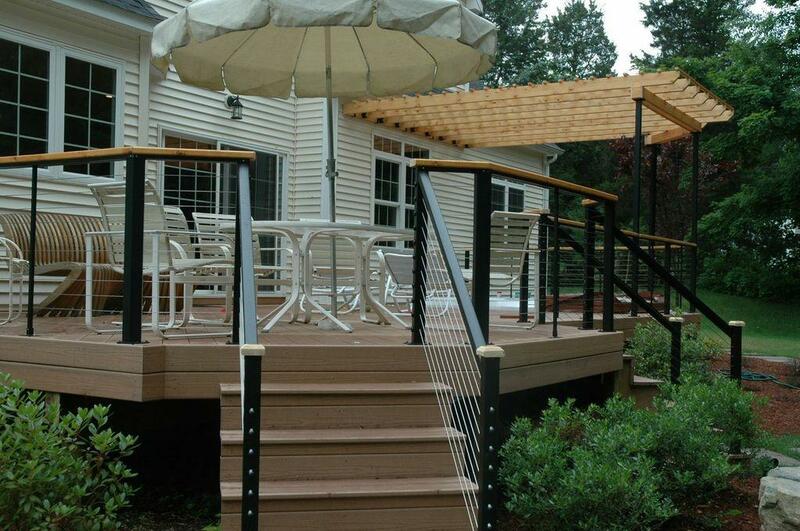 We used Fiberon Ipe decking on the deck, stairs and screened porch. 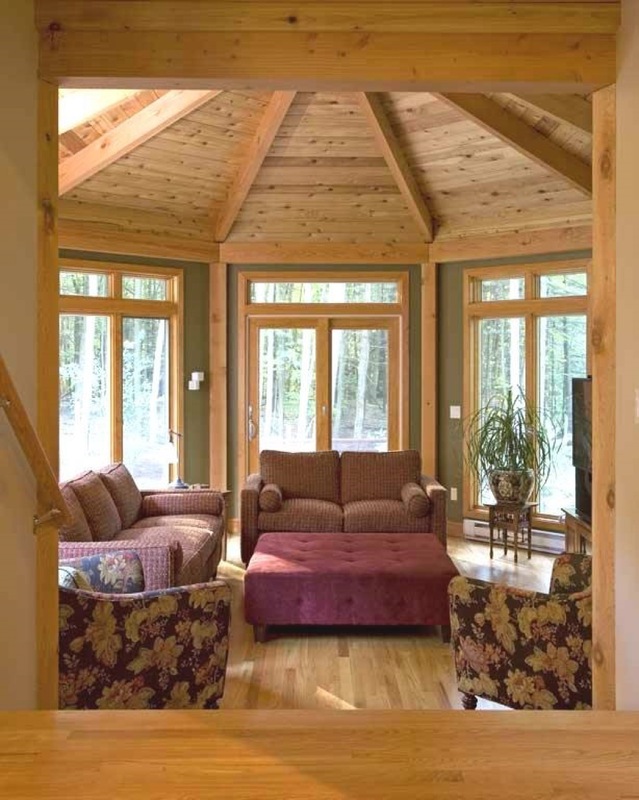 The screened porch features a tempered glass knee wall and gable end queen fan trusses so the view into the spacious backyard is never obscured. Part of the ease of this design is the way Archadeck of Central CT built the stairs wide enough to serve as seating. This element makes it easy to play musical instruments within the space as no constraints are present. The homeowners are elated with their new space. 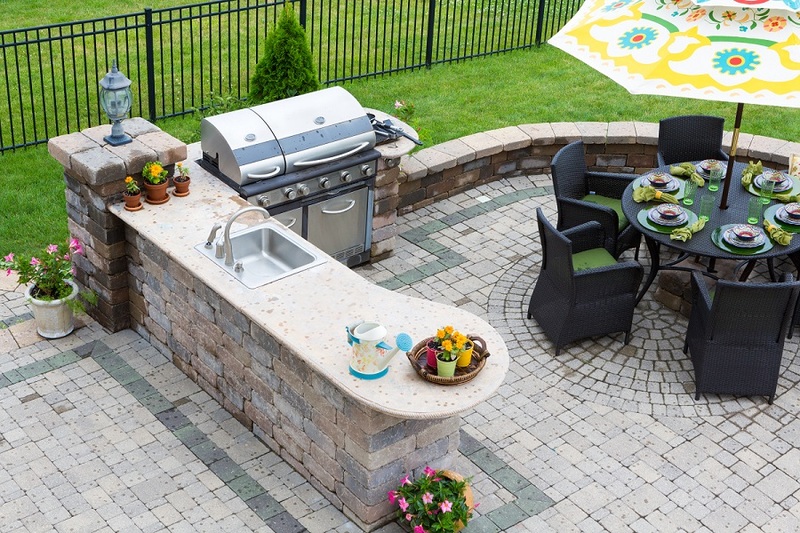 There is no denying the appeal of an outdoor living combination design. Outdoor living combination spaces, such as this project, marry the function and aesthetic elements of two or more outdoor structures allowing them to function as one large space. 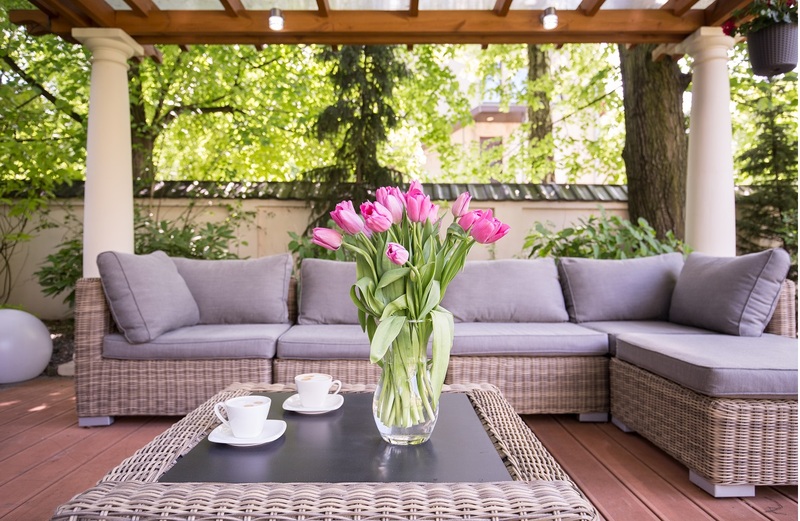 If an outdoor living space is part of your plans for the upcoming outdoor season ahead, consider the benefits of a combination space. 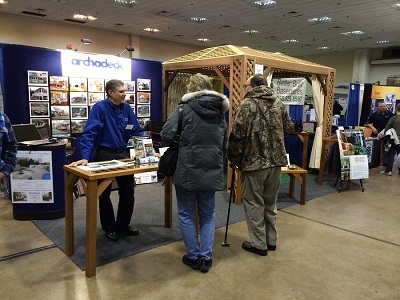 Contact Archadeck of Central CT today to add harmony to your outdoor living lifestyle. Call (203) 793-7142 or email us today! How do we know this? Our customers tell us. How do we do it? Over the years, we have developed a design process that works every time. One of the most important steps in that process features our 3-D architectural design renderings. 3-D renderings provide much more insight than a traditional plan. When we are working with you, clear and direct communication is vitally important. We’re only going to be working at your home for a number of weeks, but the work we’re doing there will affect your daily life for years. Without clear communication, we may not succeed in building the perfect outdoor living space for you and your family. You are expecting a lot from us, and we want to live up to those high expectations. Our 3-D design renderings stimulate clear and direct communication in two ways. Once we get a good sense of what you have in mind for your new outdoor living space, we translate that into a visual interpretation, a set of computer-generated 3-D architectural renderings. Each set of renderings shows you at least three different points of view and one overhead floorplan layout. We may go through a number of iterations of the design renderings and we’ll talk with you about them at each phase. Keeping that line of communication open means we encourage you several times to share your feedback and ideas — and any misgivings, if you have them. We want to know! We won’t be satisfied until you are thrilled with the design. For example, here you can see 3-D drawings for one of our recent outdoor living projects. 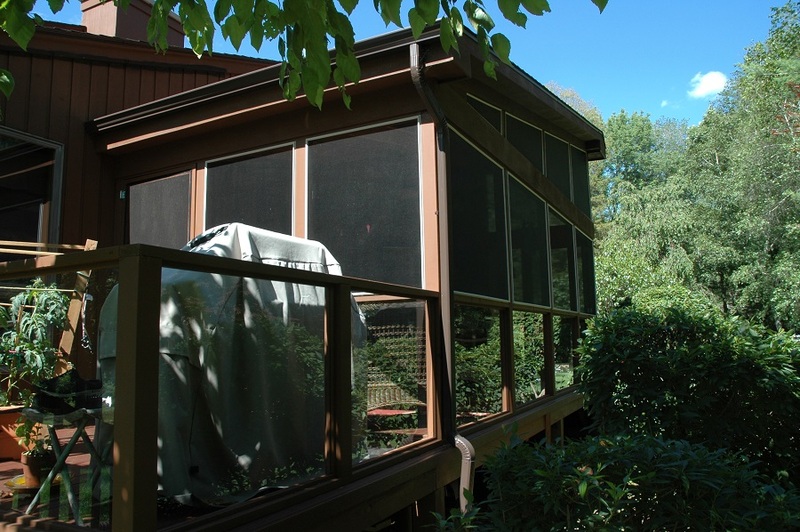 It’s a screened porch/deck deluxe outdoor living combination project in Woodbridge, CT, with skylights in the roof of the screened porch. In the Early Design image, the skylights were smaller. 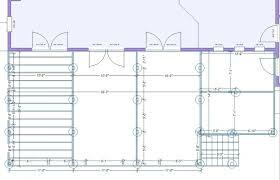 As we reviewed the drawings with our client, they mentioned that they thought the skylights should be bigger. It is far easier, (and less expensive), to change something during the design phase (IE. 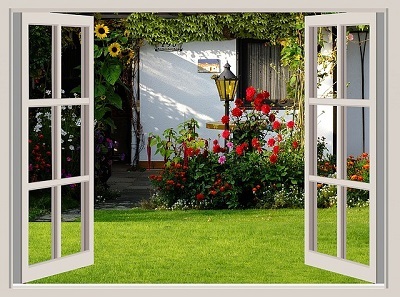 the size/type of window rather than making a “field change” during construction). It may not seem like a big deal, but if the client had not felt comfortable speaking up, we might have installed smaller skylights. Our collaborative process allows us an opportunity to provide a Revised design for consideration. Our goal is to avoid a situation where, every time that client went out onto the screened porch and looked up they think, I really wish those skylights were bigger. That’s not the feeling we want to leave any of our clients with! The first set of drawings presents a basic visualization of the project. 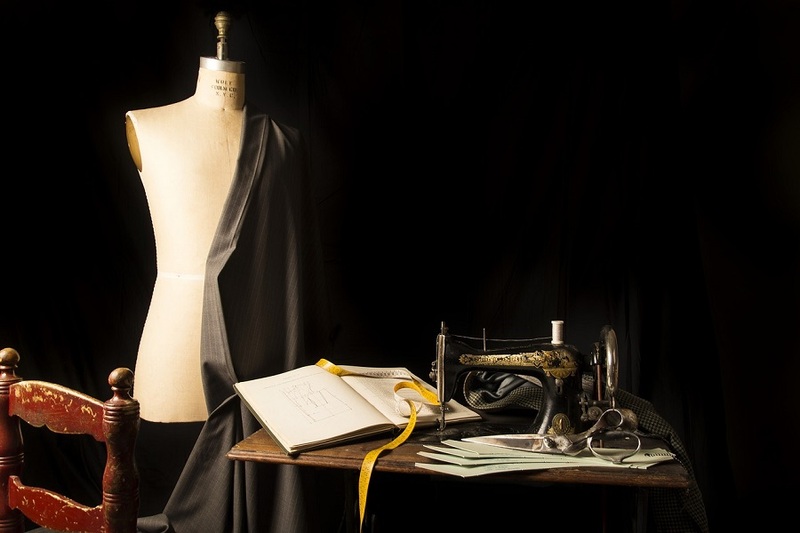 Subsequent versions are collaborations working toward finalizing the design you’ll love. Clients consistently tell us that, looking over the renderings after each time we fine-tune them can trigger new ideas. You can see intricate details in a 3-D design rendering that you cannot see in an ordinary 2-dimensional drawing. With a 2-dimensional plan, you can miss small things that may turn into big things once the project is completed. 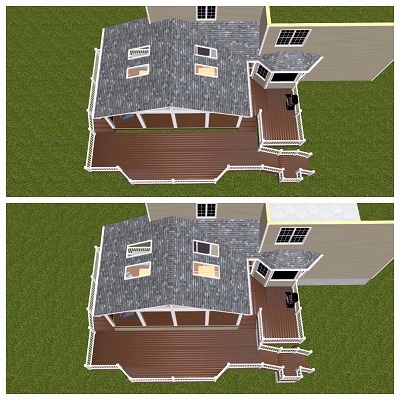 Looking at a 3-D rendering, we encourage you to visualize traffic flow from the house to the outdoor living space and throughout the outdoor space itself. 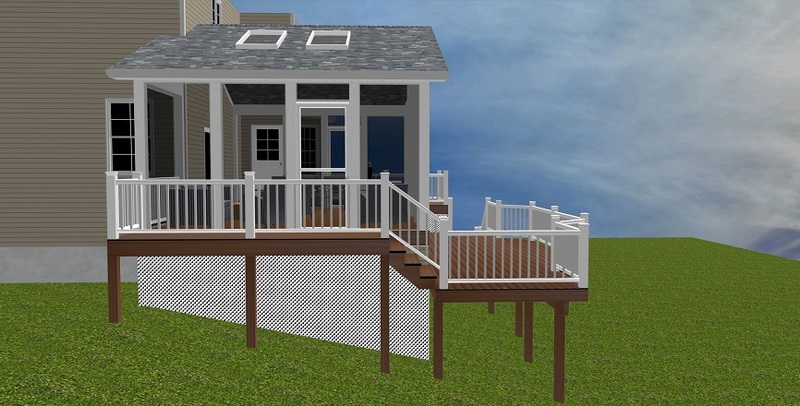 We can place furniture in the rendering, to scale, so you can see what pieces will or won’t fit into your new deck and/or screened porch design. If we are discussing alternate design ideas, we can use two sets of 3-D renderings to compare them and see which option is closer to what you have in mind. Or, the drawings could lead you to ask you about a third option we’ve not yet considered. Take another look at these renderings of our recent project in Woodbridge, CT. We tried different ideas for the under-deck skirting. 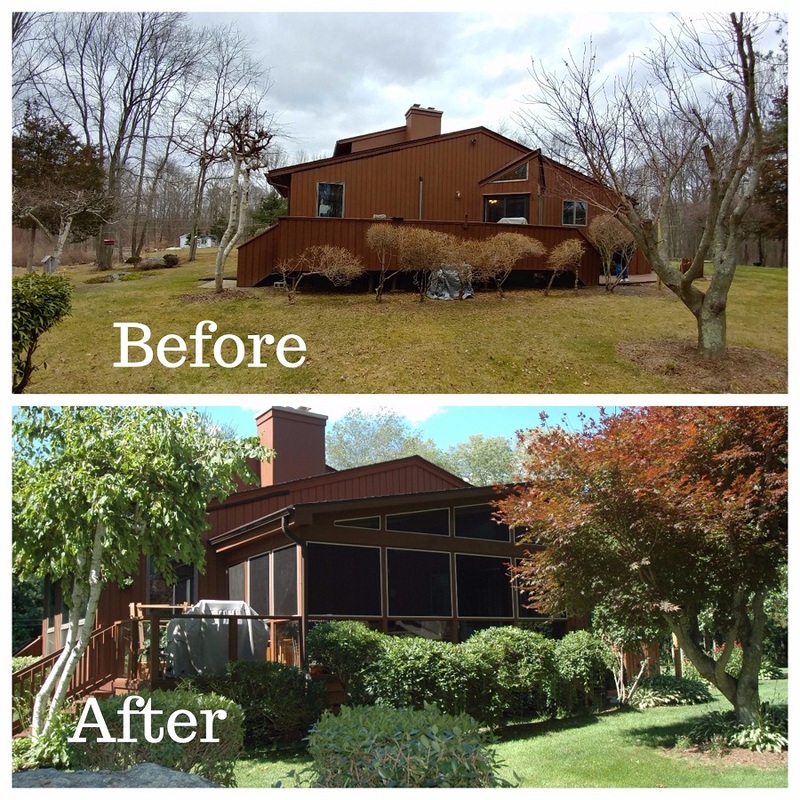 The client asked us to change the skirting from brown lattice to white after they saw a 3-D rendering of how the brown would look against the backdrop of the home’s siding. One idea leads to another. For helping you get a clearer view of how the finished project will look, one 3-D rendering is worth any number of words. Using these computer-generated design renderings plays a huge role in the way we deliver exceptional customer service. Every version of the design carries us a step closer to our goal: making the client happy — from the initial design discussion to the completed project and for years to come. If you’re ready to let us turn your ideas into 3-D design renderings for an outdoor living space at your home in Woodbridge, Farmington, Cheshire or anywhere else in Central Connecticut, call us at (203) 793-7142 or email [email protected] to get started. We promise you’ll appreciate our version of great customer service. Archadeck of Central CT asks, "When is a window better than a wall?" The answer: When you want to see through it! 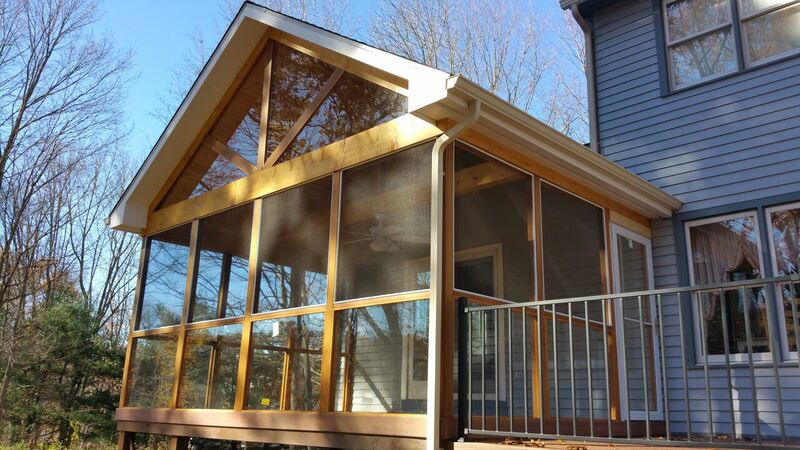 Today’s featured project in Colchester, CT, combines a re-decking with a conversion from deck to screened porch, and it is a stunner. Two aspects stand out on this project. First, in replacing the original deck wall with tempered glass, we have opened up a whole new world for these homeowners. Second, the porch addition blends in so well with the cedar home, you would swear the porch had been there all along. The Colchester homeowners had a wooden deck along the side of their beautiful, rustic cedar home. Since the deck was aging, it was time to have it re-decked or replaced. 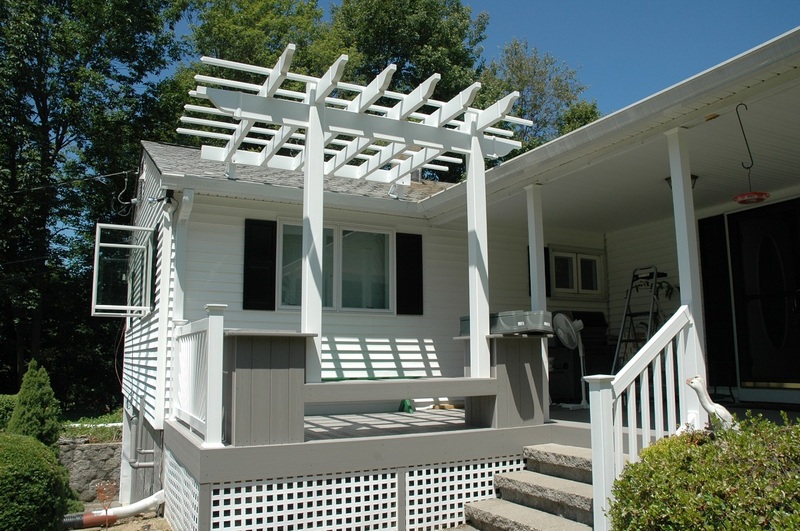 The homeowners wanted to turn most of the deck into a screened porch, and in the process they wanted a railing or wall system that they could actually see through. Archadeck of Central CT worked with them on a design to make that happen. The original deck railing topped a wooden wall instead of pickets or balusters — great for privacy, but terrible for enjoying the outdoors. While the deck was lined with shrubs, the view was completely obscured, so people on the deck could not see them. They could only see the wall straight ahead and the sky above. The overall feeling on the original deck was that of being penned in. The new design is something to celebrate. Most of the deck is now a porch with tempered glass below the railing where a wall once stood. Above the railing is screen. Anyone on the deck can now look out over the landscape, communing with nature while staying dry and protected from insects. The porch is light and airy with a ceiling fan to create a breeze when there is none. A lot of work went into improving this Colchester outdoor living space, and the results were well worth the effort. First, we took the existing wooden deck apart and added necessary footings to make the deck level again. We also brought a beam up under the deck for additional support. In some projects, the entire deck needs to be removed, but in this case the footings and framework did not need to be replaced, just reinforced. Once we had repaired the deck framework, we resurfaced the deck, replacing the original deck flooring with new material. 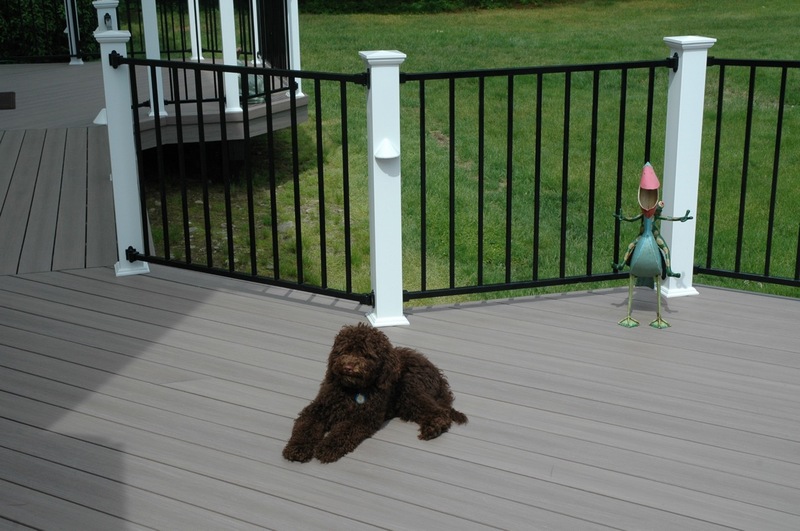 The homeowners chose low-maintenance Fiberon Symmetry decking in the Cinnabar color to match the home. 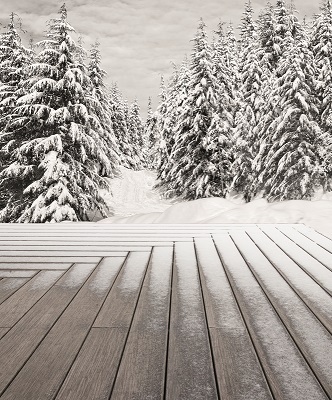 Fiberon Symmetry decking boards look and feel much like natural wood, but they are more durable. The outer layer surrounds all four sides and resists fading and staining; the durable composite core means no splintering, cracking, insect infestation or decay. With the new deck surface in place, it was time to add the porch over it. We left a portion of the deck open for a barbecue grill, but most of it is now enclosed. A tempered glass wall makes up the lower portion below the deck railing, and we used ScreenEze screening to fill in above the railing — all the way up to the vaulted ceiling. For the railings we used western red cedar stained to match existing home. Speaking of the vaulted ceiling, we designed it with the rafters exposed, so no one will feel penned up on this porch! A ceiling fan completes the scene. The homeowners are elated with the new porch and the magnificent way it ties in to the cedar home and looks original to the home. You would never know it had been added on if we had not told you. It’s our secret. 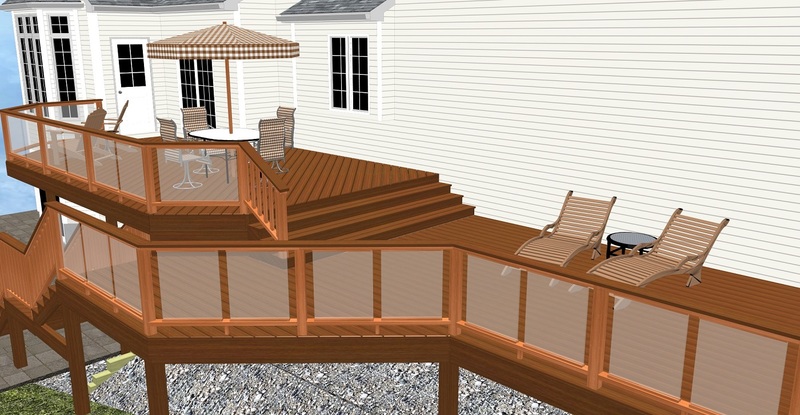 Can we create a dream deck, porch or combination outdoor living space for you? 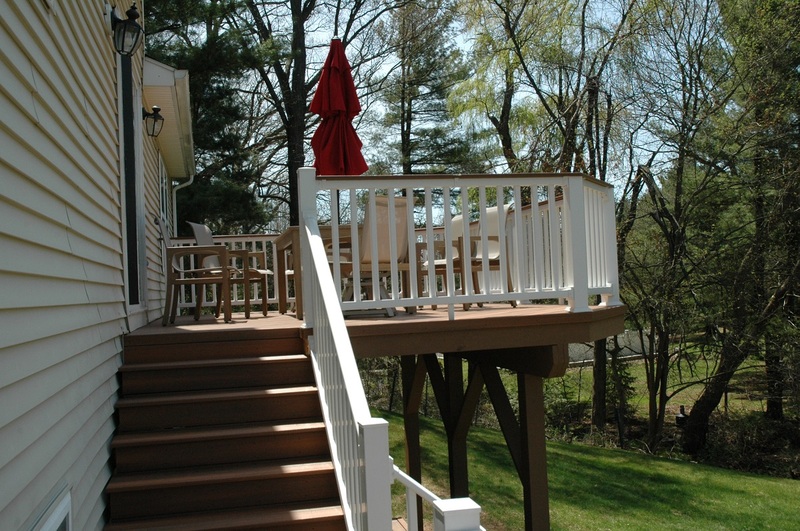 If you are thinking about converting a deck to porch at your home in Colchester, Shelton, Avon, Farmington, Cheshire or anywhere else in Central Connecticut, call Archadeck of Central CT at (203) 793-7142, or email us at [email protected] to schedule your no-obligation consultation today.